I’m sorry, I can’t even pretend to be excited about this because I absolutely don’t give a flying f**k. I’ve played the game and got bored. I tried again a few months later and gave up after half an hour. Yes there are a few cool things but overall I find it dull and uninspiring. If they bring back CASt I will absolutely give it another go because that’s what I miss the most. But that’s just my opinion. It obviously doesn’t suit my playing style. Thousands of others have enjoyed it though so some of you may be pleasantly surprised. I’ll be downloading it and hammer the crap out of it to see how well it works in OS X so stay tuned for help threads etc. 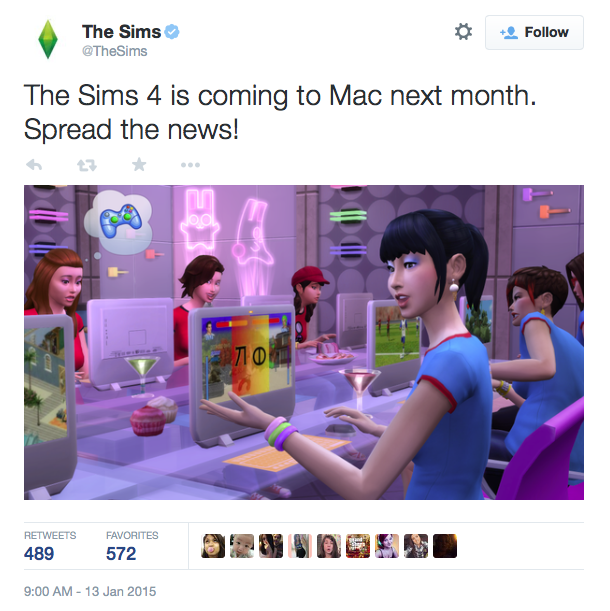 Edit – A very important point to note is that if you’re already playing The Sims 4 on your Boot Camped Mac, you will not have to buy the Mac version. EA have confirmed that whether you buy the PC or Mac version, the alternative version will be available at no extra cost, like Simcity. I sort of agree with you…. Still, here’s to hoping for the beauty of many awesome expansion packs! Heheh, I’m always an optimist for my beloved game!